Five-man leadership group unveiled Collingwood unveiled a five-man leadership group for 2015 at the Calder Park Raceway, while also announcing the signing of Holden as a Platinum Partner for a further three years. 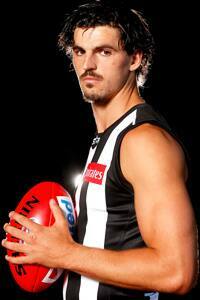 Scott Pendlebury will captain Collingwood for a second season. Scott Pendlebury will captain Collingwood for the second consecutive season and head a streamlined leadership group of five in 2015. Pendlebury, who succeeded Nick Maxwell as captain in 2014, will lead a group of four vice-captains that includes Travis Cloke, Nathan Brown, Steele Sidebottom and Tyson Goldsack. Cloke, Brown and Sidebottom were by Pendlebury’s side last year but Goldsack has been recognised with an official leadership position for the first time. The selection of the 2015 leadership group was peer driven and reflects the changing face of the squad, which is one of the youngest in the competition but also one of the most experienced. The Collingwood leadership group is relatively young, with Pendlebury, Cloke and Goldsack 27 years of age, Brown 26 and Sidebottom 24. All have much of their careers before them. Between them, however, there is five premierships and an average of 150 matches of experience. Pendlebury said that the leadership selection process had placed a premium on the ability of a player to set high standards and hold to them, on and off the field. “It’s a thrill to captain Collingwood again,” Pendlebury said. “Whether it is for our players or our fans, the leadership group has to be making sure Collingwood is always doing its best, always striving to be better. Collingwood senior coach Nathan Buckley said that through the selection process it became clear that being able to create and drive a selfless, team-first mentality was regarded highly. “Our leaders shone through for their ability to think first about what is good for the group and for their ability and willingness to bring their team-mates along with them,” Buckley said. The leadership group is selected by the entire playing list in conjunction with the coaching staff and then ratified by the board of the Collingwood Football Club. The composition of the 2015 leadership group was revealed today at Calder Park Raceway, where it was also announced that GM Holden has extended its Platinum Partner sponsorship of Collingwood by a further three years. Holden GM of sponsorship and motor sport, Simon McNamara, was on hand to confirm the extension which will see the iconic Australian car company remain with Collingwood at least until the end of 2018.